Pet ownership comes with a lot of responsibility. When you have a dog in your home, you need to be aware of certain items, products, and situations that might do him harm. No one wants a quick trip to the local emergency veterinary hospital because they are worried about their dog, but New Bedford pet owners find themselves in dangerous situations all the time that could have been prevented. Prevention is by far the best solution for providing quality vet care for cats and dogs. The more you can do to avoid dangerous situations from happening and take care of things like vaccinations and pest issues before they get out of hand, the better. Anchor Animal Hospital in Dartmouth has offered professional vet care services in Southeastern Massachusetts for many years and is proud to have earned a solid reputation within the local area. Start by going through your house from room to room, looking for anything that could harm your pets. Many New Bedford pet owners have said that having a dog, whether a brand new puppy or older pet, is kind of like having a small crawling child or toddler in the home. Dogs like to put things in their mouth – especially things that they shouldn’t. Babies are the same way, so it helps to use baby-proofing tools and methods to safeguard your home. Crawl around at pet-level so you can see what they see and remove it from their reach. If you have cleaning products – even organic options, fragrance products, garbage bags, batteries, shopping bags, medicines, and other things that can be hazardous to pets if consumed, played with, or even licked, make sure to put them away in a cupboard where they do not have access. Consider baby locking mechanisms or locked cabinets to keep out smarty-pants dogs and cats that can “paw” their way into shut cupboard doors. Other things that can attract a curious pup include purses, backpacks, and other storage items. While it may have been months since your child had a snack cake in his school backpack, the chances are good that your dog can still smell the residue. Even just regular smells from walking to school, riding the school bus, or hanging out with friends can attract your dog, so hang up backpacks where dogs can’t reach. The same goes for purses, adult backpacks, and other bags that can hold items that could be dangerous. Pencils, pens, and other office or school supply items can pose a hazard, as well as sugar-free gum and mints that contain xylitol. Your garage can be a source of poison and danger to your pets and neighborhood pets that might find their way inside. 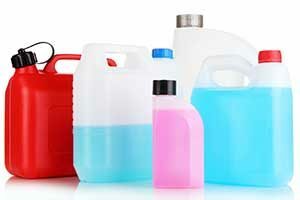 Lock up all products that can be toxic, including antifreeze, oils, cleaners, and other fluids. Antifreeze has a sweet taste that many pets enjoy, so it should be a priority in your clean-up duties. Antifreeze is extremely toxic and should always be kept away from pets and children. Other car products, lawn care products, and items typically stored in a garage should be checked over and locked up if they pose a hazard to your pet. There are lots of things that pets can get into when they are outdoors. If you let your pet outside to play or “do his business” unsupervised, you will want to go over everything to make sure that there’s nothing he can get into while he’s out there. Fertilizers and other gardening supplies can be a big problem, as well as dangerous plants both indoors and outdoors that are known to be toxic to pets. The same goes with pest control products for snails, grubs, and other insecticides or herbicides. These should all be put up and away from reach for any pet, preferably in a locked shed or cabinet. Check regularly to make sure that crafty pets or local wildlife aren’t getting into these areas. The more that New Bedford pet owners can do to prevent injury, poisoning, and other harmful events from happening to their pets, the safer they will be at home. If you should need urgent care services or preventive veterinary check-ups, bring your pet to Anchor Animal Hospital in Dartmouth. We offer a wide range of services, including preventive treatments, vaccinations, pain treatment, advanced dentistry, surgical services, and operate as a comprehensive emergency veterinary hospital. Give us a call at 508-996-3731 to schedule an appointment or to speak with one of our staff.